Having solved the Hulk’s Banner Box and proving herself the smartest person in the Marvel Universe, Lunella finds herself getting the attention of various heroes. She also gets the attention of a certain silver-armored, green-cloaked Latverian who will not abide the idea that Moon Girl is smarter than he is. Seeing Lunella interact with the Hulk, the Thing, Ironheart, Dr. Strange, and the X-Men is a lot of fun. Montclare and Reeder bring the idea of Lunella as a loner to a head here; this volume feels like the end of a larger narrative about her seeing the value in teamwork—even if she’s smarter—that positions the book to move out of origin story territory. Bustos, Height, Bonvillain, and Kirk fill every page with charm, energy, and character. 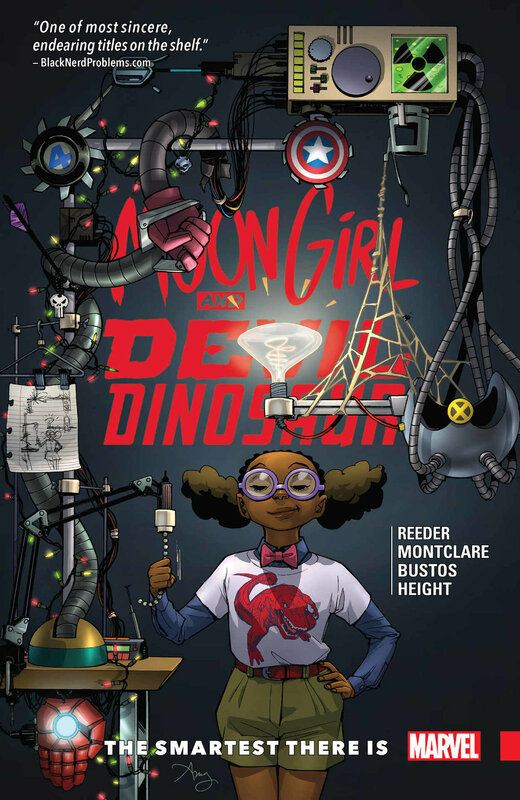 Moon Girl and Devil Dinosaur continues to surprise me. It’s charming and approachable, but it can also be bittersweet as Lunella feels isolated and, in turn, isolates herself. That impulse changes and evolves over the series’s first three arcs, and watching Lunella grow from a lonely kid into someone who is beginning to see the value in building a community is my favorite thing about this book.